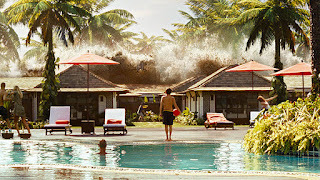 Is it a compliment to label a film about a natural disaster that claimed the lives of an estimated quarter million people “a technological achievement?” The Impossible recounts the 2004 Indian Ocean tsunami from the perspective of a real-life vacationing Spanish family caught in its deadly torrent, although recast here (for little legitimate reason) as an English family spending Christmas at a luxury resort in Thailand. The film opens with Henry (Ewan McGregor) and his wife Maria (Naomi Watts) bickering over who armed the security system before they left home. That will seem utterly inconsequential two days later when a Boxing Day by the pool turns tragic once the first 100-foot wave hits, sundering the couple and their three boys, including the eldest, Lucas (Tom Holland). Spanish director Juan Antonio Bayona (The Orphanage) accomplishes the nearly impossible task of chronicling the incalculable mayhem of this unimaginable event. Digital effects capture the power of waves strong enough to topple trees and sweep away cars, and the helplessness of being pulled underwater and tossed around like a rag doll. Set design recreates destruction so utterly vast that survivors lose any bearing of where they are or where to go. Thrust together by the calamitous current, Maria (hey, at least her name is still Spanish) and Lucas spend the night sleeping in a tree to avoid the danger of a secondary waves. Yet, notwithstanding a leg gash Mara suffers that proves nearly fatal due to harried medical care, the bulk of The Impossible becomes a human scavenger hunt led on two fronts by Henry and Lucas. Separately, they search for the rest of their clan through razed resorts full of white tourists, emergency shelters full of white tourists and hospitals full of white tourists. You hardly know whether any brown-skinned natives even got their feet wet, except to wade in and rescue the white, well, you get the idea. The cast is uniformly terrific—especially Watts, who again reminds us of her superlative acting range no matter the script or subject-matter. But while there’s nothing wrong with a story of perseverance in the face of disaster capped by a happy ending, it becomes myopic if told to the virtual exclusion of the surrounding carnage. It’d be like making a movie about surviving 9/11 without mentioning that lots of people died.